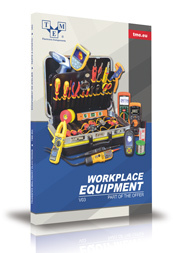 We're pleased to inform that we have prepared a new catalogue of workplace equipment. On more than 200 pages the catalogue presents measurement devices, accessories for measurement and labs, soldering equipment, welding devices, power generators, as well as tools, chemicals, antistatic products, and products connected with storing technique. It also includes lamination products and printed circuit boards along with materials. The catalogue is available in several languages (Polish, English, Italian, Romanian, and Czech).